The SmartQ R7 is made by Smart Devices, and it's their third 7" tablet. Smart Devices certainly designed the R7 as an ereader, but along the way they may have turned the R7 into a better tablet than its predecessors. The difference between the R7 and the earlierOn the other hand, some of the improvements came at a price. Scroll down to the end for a hands on video. When compared to its predecessors, the R7 is thinner and weighs less. The curved back has been flattened, and the flimsy stand is gone. All of the buttons are on the front of the R7, and the new d-pad on the front is a thoughtful addition that enables one handed operation. One useful improvement in the design is that all the buttons, slots, and ports are at one end of the R7. Its predecessors had them on 3 different edges. But, the downside of the R7 being thinner and lighter is that it has a weaker battery which is only about 2/3 the size of the one in its predecessors. Patrick reported getting 5 hours battery life with Wifi on; I usually got 8 or more on the SmartQ 7. Smart Devices reversed themselves with the R7 by only offering the Linux firmware. 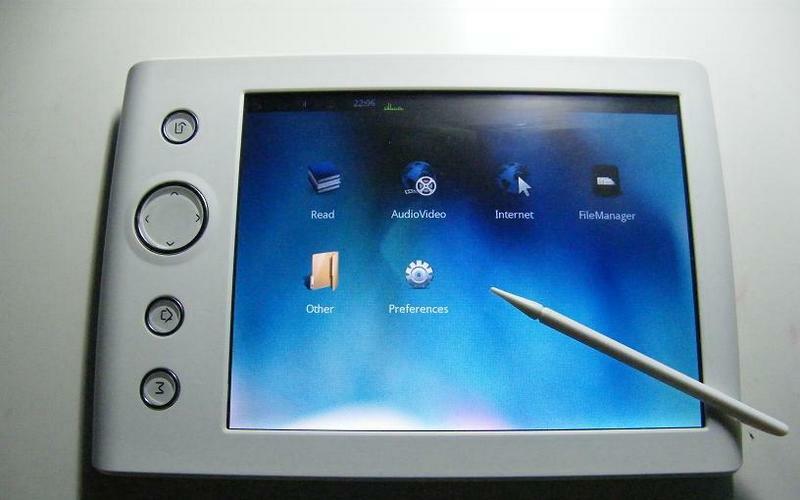 (They had offered Linux+WinCE for the SmartQ 7 and Linux+WinCE+Android for the V7.) This was a good idea, IMO. The problem with the extra firmwares was that they didn't work very well. Based on my experience, Smart Devices didn't have the 3 development teams needed to maintain all the firmwares. The Linux firmware is the best developed so I'm glad they kept it. With the new form factor and a new e-book reader application, the SmartQ R7 is a very interesting option for those who want to have an e-book reader with a color screen. The default application has automatic screen rotation and displays almost every file you throw at it, even comic books in CBR/CBZ format. As expected, large PDFs and comic book files with a lot of images are a bit sluggish, but it’s still much speedier than readers with an e-ink screen. The reader application comes with a web store with a lot of free magazines available to download. Unfortunately these are all in Chinese and download speeds are horrible if you live somewhere else. However, with the internet capabilities of the R7, it’s still very easy to get your e-books from other places. This is where the R7 outshines its predecessors. One problem with the V7 is that the screen is rather short in landscape mode (only 480 pixels tall ). The R7, on the other hand, is 25% taller, and that difference means a lot. The R7 has the same Midori browser as the earlier models, so it has the same limitations on site compatibility and Flash support (none). The browsing and reading experience won me over, and now that the R7 is only $35 more at e-world, I wouldn't hesitate to recommend it over the other 2 models. But I'm still concerned about the battery life. You might want to trade the screen for battery life. Probably a stupid question, but that’s never stopped me b/4! I have a bunch of PDB DRM books that I wouldn’t mind reading in bed. I don’t think it would work, but I’m not sure. I’d bet that the eReader Linux app was made for an Intel CPU and the R7 has an ARM CPU. But let me test it.